Looking to revamp their downtown office spaces with sustainable, locally harvested materials, local Boston architects, developers, and designers are drawn to the historical significance, elegance and character of our reclaimed Boston Tea Party Oak. Our Wharf wood from Boston Harbor is beautifully featured throughout the new Price Waterhouse Cooper building located at 101 Seaport. Today, shipwrights working on replicas like The Beaver and The Eleanor, are choosing reclaimed lumber from The Jarmak Corporation to outfit their sailing vessels with the highest quality wood around, just like the made in America originals. New England’s largest buyer and seller of reclaimed lumber. PROVIDING WHOLESALE PRICING TO THE PUBLIC. Timber, planks, tongue and groove flooring, wall panels, in addition to custom countertops, tables, mantels and more! Vibrant colors, rich character, and classic style define our reclaimed wood. It suits a variety of tastes and building applications from traditional homes, contemporary offices, and rustic cabins. The beauty of our premium quality reclaimed wood is like no other. Crafted with old-world care by local craftsmen, most of our wood is between 200-500 years old. We select the finest timbers, beams, and flooring from historic industrial buildings all over the country, continuing their legacy and telling their story. Drop by our lumberyard in Oxford, MA to begin your project! We are located at 235 Old Webster Road, Oxford, MA 01540. We provide reclaimed lumber for a broad range of customers and construction projects, from sustainable office building renovations, to environmentally responsible residential remodels. Sustainable-minded builders and designers, as well as wholesale lumber dealers love our reclaimed wood. Homeowners, architects, designers, builders, and developers trust our products in their #sustainable building projects, including (but certainly not limited to!) those that seek the U.S. Green Building Council’s LEED certification, historic restorations, or in any application where the characteristics of reclaimed, old-growth wood are desired. We encourage EVERYONE who is interested in using reclaimed wood for ANY project to contact us, or stop by our lumberyard in Oxford, Massachusetts to find out what The Jarmak Corporation can do for you! We have saved tens of millions of board feet of vintage, and often historic lumber to share with our customers, ensuring that the legacy of this beautiful old wood will continue for generations to come. We are passionate about our work and our products, because we’re not just selling reclaimed wood- we’re sharing a piece of history. The majority of the reclaimed wood we save is in the form of large and often historic timbers, joists, decking and flooring. We sell large quantities of premium quality reclaimed old-growth southern yellow pine timbers and decking throughout the US and internationally on a wholesale basis. We also supply local homeowners, architects, timber framers, builders, flooring manufacturers, and furniture makers who are all choosing sustainable, salvaged and recycled building materials like reclaimed wood from the Jarmak Corporation. It’s always best to contact us as soon as possible. We can help you decide on which one of our premium reclaimed wood products is best for your project. Many of our customers choose our products because of our quick turn-around time, usually within just a few weeks, versus a month or more when choosing wood from our competition. Click here to contact us about your project. The Jarmak Corporation is proud to work with our local community to bring the highest quality reclaimed wood products to the market, promoting sustainable building products and businesses! Our lumberyard and shop is just a 15 minute drive from downtown Worcester, Massachusetts, an hour outside of Boston, and provides a wonderful glimpse of our process to save beautiful, historic, premium reclaimed wood. Many of our high-end commercial and residential reclaimed wood products are crafted by hand at our saw mill Antique Lumber Co. in Lancaster County, Pennsylvania. We encourage everyone to visit our sawmill, or our lumber yard and shop in Oxford, Massachusetts. Click here for directions and to schedule an appointment. The Jarmak Corporation has been providing premium quality reclaimed lumber to New England’s top building professionals for close to two decades. Catering to sustainable-minded architects, designers, builders, flooring manufacturers, timber-framers, millworks, and furniture makers across the country as well, we can answer any questions regarding the history or process of choosing and using our premium reclaimed wood products in your next project. We provide only the finest quality reclaimed wood beams, timbers, flooring, trim and high-end custom millwork with one-of-a kind looks that will last a lifetime, and then some! LIKE WHAT YOU SEE? SUBSCRIBE TO OUR MONTHLY E-NEWSLETTER. 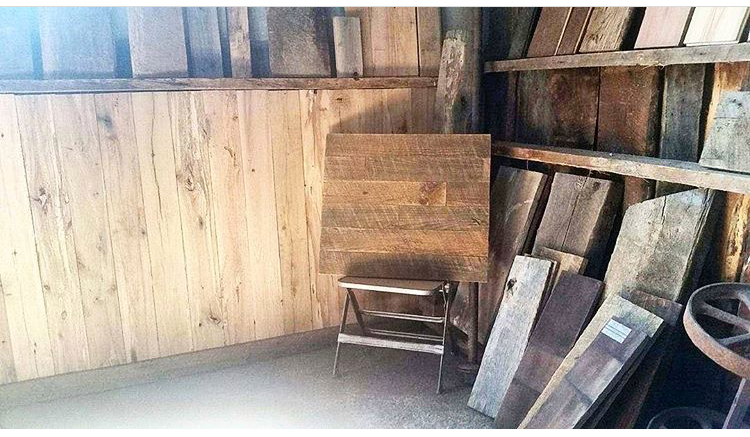 We’d love to share the stories of our beautiful, historic reclaimed wood with you. Join today for the our latest projects, inventory updates, industry news, and tips from our professionals. There’s a reason we have over 7,500 subscribers… they love our stories. We think you will too!